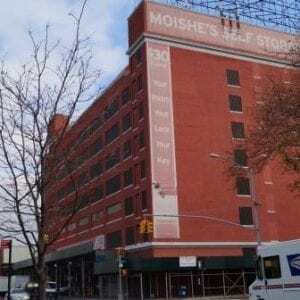 When you need a warehouse for rent Bronx, whether for commercial or personal storage uses, call on Moishe’s. We consistently receive 5-star ratings from our customers due to our customer service-oriented team’s excellent service and our 100% customer satisfaction guarantee. Moishe’s offers free pick up for our customers within the 5 boroughs. When you’re a new customer with us, we offer to pick up your belongings, up to a 5×10’ space, with a 3-month commitment to storage with us. Call us at (800) 536-6564 to schedule your free pick up today and our relocation experts will drive one of our trucks to your location, pick up, load, transport and store your belongings for you, at no extra cost! Why waste your time and effort loading and unloading a truck yourself when our experienced NYC movers will do the job for you, at no extra cost? Contact Moishe’s today for your next move into storage made easy. When you need extra security for your personal or commercial warehouse for rent Bronx, look no further than Moishe’s Self Storage. Not only do we offer 24-hour access to your storage unit, we employ round-the-clock security personnel to ensure your belongings stay safe with us. The same technology banks use to prevent theft is what our customers deserve in the protection of your belongings. A security personnel team monitors our CCTV recording cameras in every hallway of our storage space, at all times, to eliminate theft. We also utilize motion detectors, state-of-the-art burglar alarms, security checkpoints and the latest in fire suppression technology to keep your items in storage safe with us, 24/7. That’s the Moishe’s difference. Feel free to schedule a free consultation with one of our account managers today. One of the account managers will be happy to help you estimate the size furniture storage warehouse for rent Bronx you’ll need. With over 20 different unit sizes available, including customizable options, you’re sure to find the perfect fit for all your storage needs at Moishe’s.